Low testosterone, also called hypogonadism, can cause a man to lose his fertility, body mass, self-confidence, and energy. 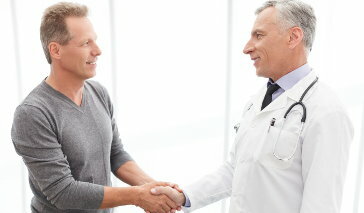 A urologist can help diagnose the condition, and explain the treatment options for low testosterone. Testosterone is a hormone produced primarily by the testes and its levels are controlled by a feedback loop between the hypothalamus and pituitary gland. All three (testes, hypothalamus, and pituitary) must be working properly to sustain the appropriate hormone levels. Low testosterone can be caused by a problem with the testicles themselves, or it can be caused by a problem with the pituitary or the hypothalamus. Pinpointing the cause will determine how the condition is treated. The condition can occur in babies (due to undescended testes) and boys (due to mumps or sexual development disorders like a genetic condition called Klinefelter syndrome), as well as in adult males. Sometimes, a medication that a man takes for another condition can lead to low testosterone. Some of those medications, along with alternative therapies to consider, are described below. An acute illness, such as heart attack or sepsis, can decrease testosterone levels, but the effects typically only last a short while and no treatment is necessary. Beta blockers, which decrease testosterone and impede arousal by interfering with nerve impulses. Alternative treatments include antihypertensives, such as calcium-channel blockers, that don't interfere with sexual function. H2-receptor antagonists, such as cimetidine (Tagamet) and ranitidine (Zantac), which are used to treat gastrointestinal disorders (such as gastroesophageal reflux and peptic ulcers). Alternative treatments include changes to diet and sleep habits, or trying melatonin at night and during the day, consuming several glasses of water with one tablespoon of apple-cider vinegar and one tablespoon of honey mixed in. If the cause of low testosterone stems from issues with the pituitary gland, it may be possible to restore fertility through the use of pituitary hormones. If the pituitary gland is simply underactive, the hormones would reinstate the pituitary-hypothalamus-testes feedback loop and revive sperm production. If, however, the pituitary is disrupted as a result of a tumor, surgery, medication, or radiation treatment, a hormone replacement therapy may be required. Injections: These are given in the muscle roughly every two weeks (and work best for fertility issues). Patch: This hormone patch is applied to the back, upper arm, thigh, or abdomen every night. Gel: A gel containing testosterone is rubbed into the skin. Skin-to-skin contact with anyone should be avoided until the gel is dry. Oral: In this approach, the testosterone is applied where the upper lip and gum line connect. But this method is not good for long-term use because it could increase the risk of a heart attack, cause liver damage, and raise cholesterol levels. Pellets: Testosterone pellets are new to market and consist of tiny, compressed cylinders of testosterone that are injected into the fat of the buttocks, just below the waistline, and are absorbed into the skin over a few months. Men with breast or prostate cancer are advised against TRT. Pantalone KM, & Faiman C. (2012). Male hypogonadism: More than just a low testosterone. Cleveland Clinic Journal of Medicine. Bhasin S, Cunningham GR, Hayes FJ, et al. (2010). Testosterone therapy in adult men with androgen deficiency syndromes: An endocrine society clinical practice guideline. The Journal of Clinical Endocrinology and Metabolism. Dandona P & Rosenberg MT. (2010). A practical guide to male hypogonadism in the primary care setting. International Journal of Clinical Practice.